2007 Aprilia RSV 1000R Factory. Picture credits - Aprilia. Submit more pictures. This year�s Master Bike has scientifically and conclusively demonstrated that the Aprilia RSV 1000 R Factory is the most efficient winning machine on the racetrack. It is also the first non-Japanese bike to dominate the final points table. Fuel system: Injection. Integrated electronic engine management system. Indirect multipoint electronic injection. 57 mm throttle bodies. 10.3 litre airbox with Air Runner air scoop. Lubrication system: Dry sump with separate steel oil tank. Frame type: Box section sloping twin-spar frame in aluminium alloy. Rear suspension: Aluminium alloy double arched member swingarm. Aprilia Progressive System (APS) linkages. Ask questions Join the 07 Aprilia RSV 1000R Factory discussion group or the general Aprilia discussion group. Bikez.biz has an efficient motorcycle classifieds. Ads are free. Click here to sell a used 2007 Aprilia RSV 1000R Factory or advertise any other MC for sale. 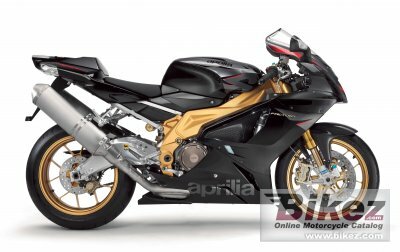 You can list all 2007 Aprilia RSV 1000R Factory available and also sign up for e-mail notification when such bikes are advertised in the future. Bikez has a high number of users looking for used bikes. Before you buy this bike, you should view the list of related motorbikes Compare technical specs. Look at photos. And check out the rating of the bike's engine performance, repair costs, etc.